TIMER software for the printer and parallel port. Software for the printer and parallel port. An Output is a connection from the computer to an external device. This can be anything from solenoids, relays, lights to pumps and security. These devices can be switched On or Off by the person operating the computer or by the times set by the program. Each external device can be controlled in On, Off or Auto modes. 2. 5 Inputs that can control devices, to be On or Off. An Input is a connection from the computer to an external switch. This can be a doorbell, a sensor or switches etc. These external switches can then be used to control an external device to be On or Off. 3. 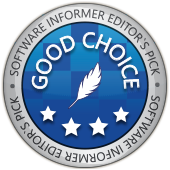 Can be used on any computer that has WIN 2000, NT, XP and Vista 32 bit, WIN 7,8 & 10. 4. Able to be minimised to run in background. 5. Is user friendly. Our product/service is purchased by corporations, universities, and organizations around the world. 30 Day trial with full features. Renewal option for 6 months saving $40, with great value for short term use. Renewal option for 12 months saving $35, with great value for short term use. Download program from this site. This is a program that enables the PC to connect to the outside world, by using the printer and parallel port LPT1. Hardware can then be connected to the computer to control solenoids, relays, lights and sensors etc. Timer, consists of 11 forms. A main form, 8 output forms, 1 inputs form and a settings form. The main form gives the status of all 8 outputs and 5 inputs. The location of each output and input can be altered on this form. Each output form can be selected by the push-buttons marked 1 to 8 or the inputs can be selected by the push-button Inputs. The main form can be minimized so that the user can do other tasks, and the timing program will still run in the background. All output forms can be in ON, OFF or AUTO modes. When in AUTO the output will be on or off depending on the times selected. Only output 7 will work over the midnight period e.g. 11pm Friday to 2am Saturday, by selecting start and finish days. Output 8 can have up to 10 switching times within the 24hr period from 00:00:00 to 23:59:59. Outputs 1 and 2 have an additional pulse timer of 1-60 seconds and 1-60 minutes. The pulse will work regardless of the mode the form is in, ON, OFF or AUTO. The Inputs form can have up to 5 inputs. Inputs 1 and 2 can turn on or off outputs, if outputs are in AUTO mode. 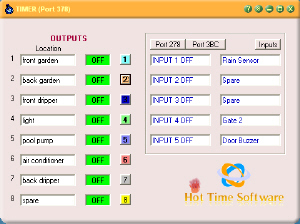 Input 3 can turn on or off outputs for a set time, if the outputs are in AUTO mode. Inputs 4 and 5 can play a selected sound (.wave file) in windows\media and c:\timer.